In short, the foods in circulars are not that healthy. Proportions of food groups advertised in 52 weekly US supermarket sales circulars in 2009. 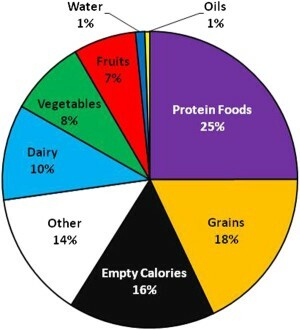 The nutritional content of Americans’ shopping carts is suboptimal despite federal dietary guidance, in this case, the MyPlate consumer icon which displays desired proportions of vegetables, fruits, dairy, grains and protein foods for consumption. Consumers mention print advertising—such as weekly sales circulars—frequently as influencing their grocery shopping decisions.